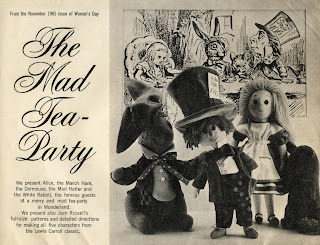 The November 1965 issue of Woman's Day magazine featured The Mad Tea-Party, a set of cloth dolls of characters from Lewis Carroll's "Alice in Wonderland," designed by Joan Russell. 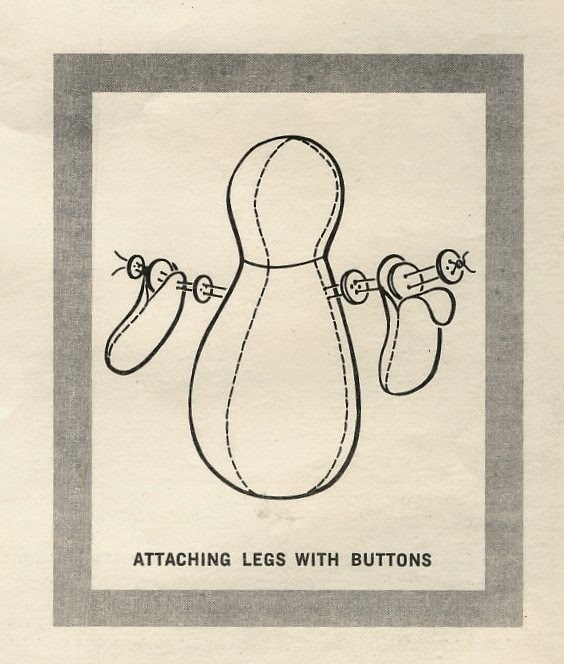 The magazine included free patterns on tiny grids for you to enlarge, or you could order the set of full-size patterns by mail. The full-size patterns are on six 17" x 22" sheets of paper, with black and white illustrations. No size is given, but Alice looks to be about 14" tall. 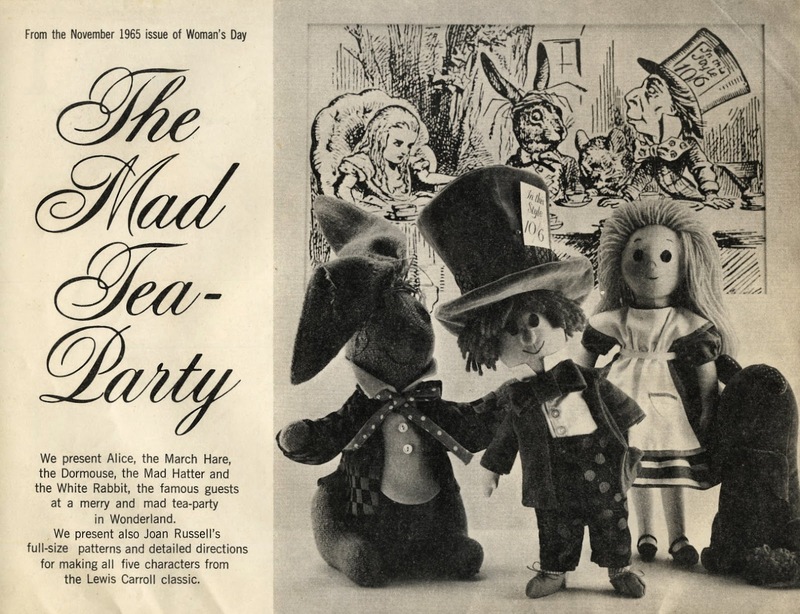 The Mad Tea-Party includes Alice, the March Hare, the Dormouse, the Mad Hatter and the White Rabbit. The heads and torsos of the dolls are sewn in quarters, with two piece arms and legs, jointed with buttons. 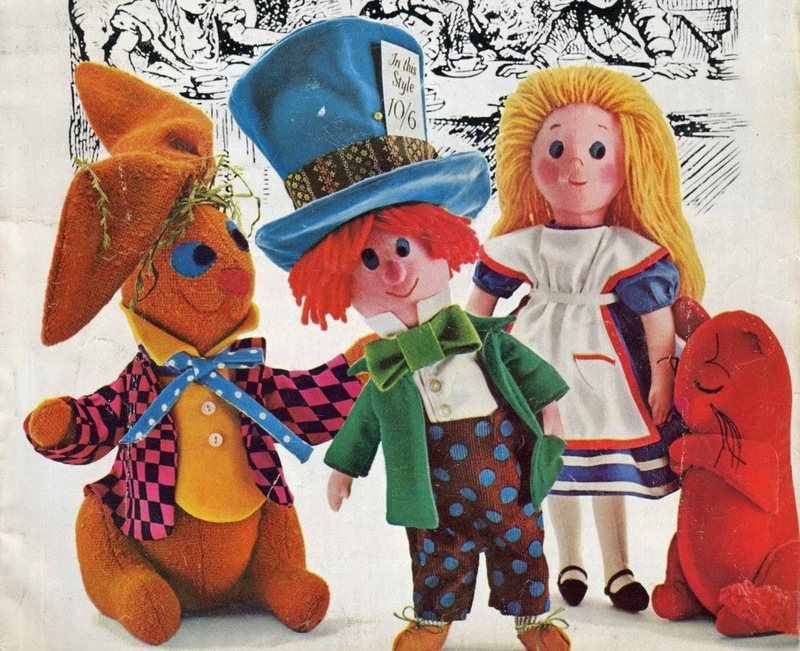 The maker is instructed to make Alice and the Mad Hatter from cotton, the White Rabbit and March Hare from wool, and the Dormouse from velveteen. 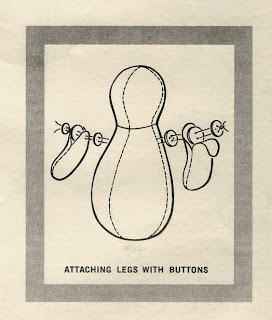 They have appliqued and embroidered facial features. The Mad Hatter's nose is stuffed to give it dimension. The hair and tails are of yarn. Each character, except the Dormouse, has a simple version of his or her outfit, well known from the classic illustrations by John Tenniel. 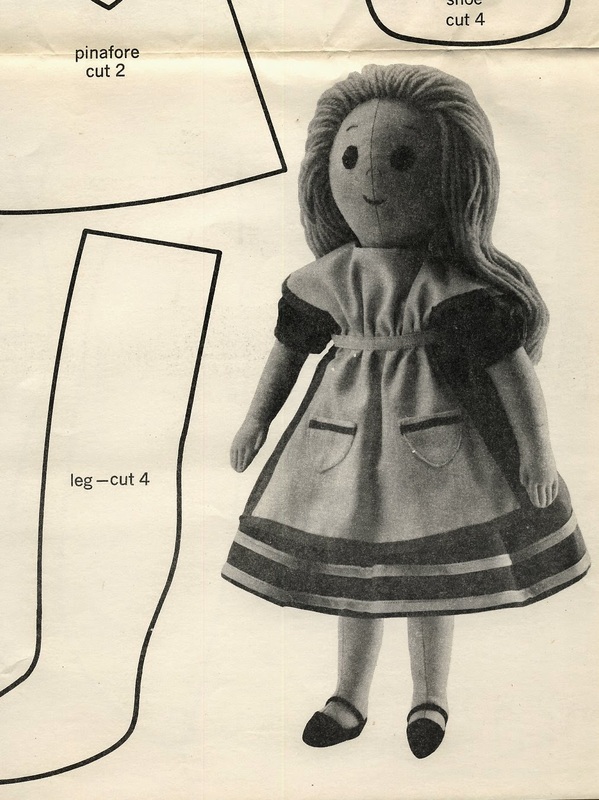 Alice wears a short sleeved dress, a pinafore with two pockets, and felt shoes. 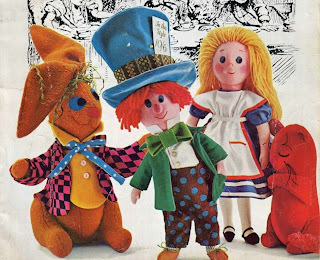 The Mad Hatter wears a sleeveless shirt, corduroy pants, jersey jacket, velveteen hat, felt bow tie and shoes. 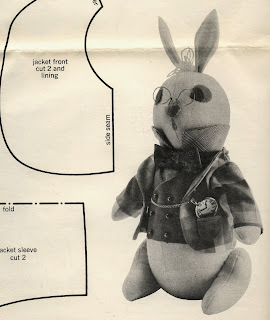 The March Hare wears a sleeveless shirt with simple tie, and a jacket. 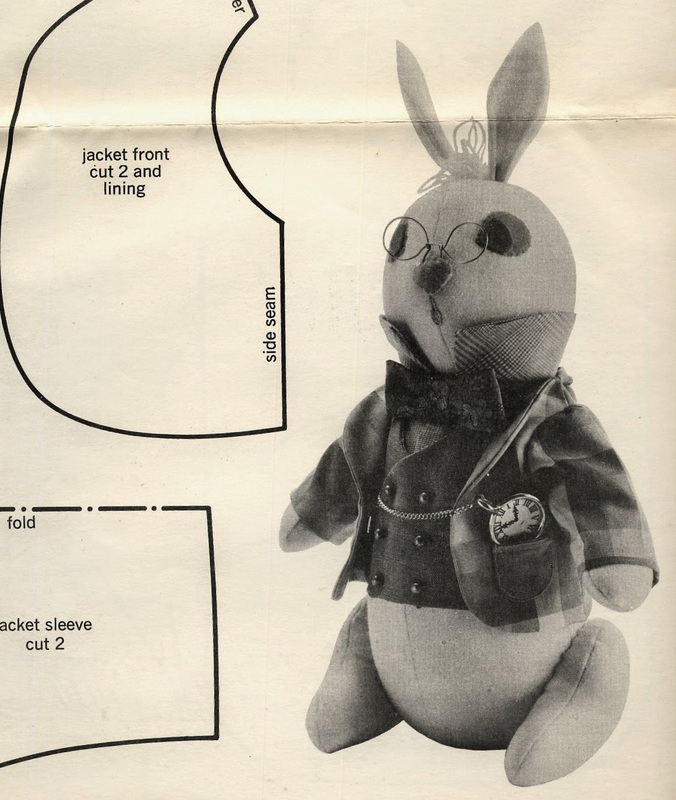 The White Rabbit's outfit consists of a sleeveless shirt, vets, jacket and bow tie. These simple patterns in Joan Russell's signature style are simple to make, and will delight fans of this classic story.